Chef Vince Joseph and his son Christian. Most summer camps involve arts & crafts and swimming, but if your kid is more of the aspiring "Masterchef Junior-type" then listen up. 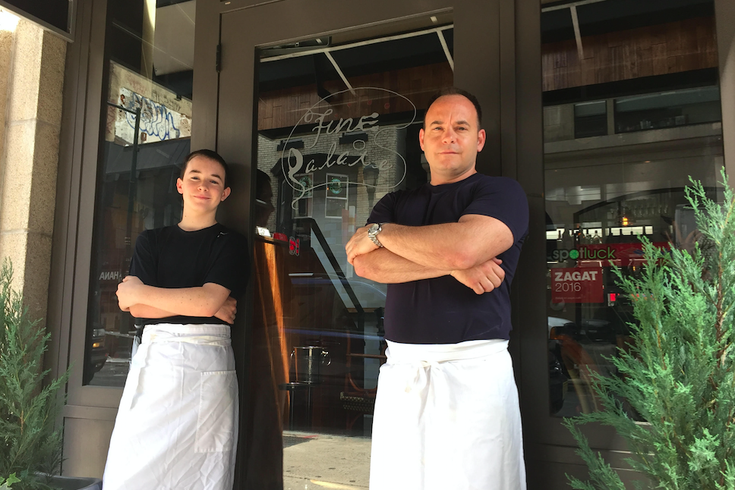 The Center City restaurant Fine Palate will begin offering culinary classes for kids. The first "Culinary Kids' Camp" will be held on July 6, beginning at 11 a.m., with more to be scheduled later in the summer. Chef Vince Joseph and his son Christian will lead the four-hour class for kids, ages 10 to 15. The cooking class, with only 10 spots available, is $50 per camper. Proceeds benefit CHOP. Campers will learn how to compose a salad and hand-chop beef for Fine Palate’s signature burgers (which they will have for lunch). The kids will also prep food for dinner that evening. The menu that will be served is buffalo tartar, tagliatelle pasta with basil, garlic and San Marzano tomatoes and a Baked Alaska dessert. The class ends at 3 p.m. but parents and kids are invited to Fine Palate for dinner between 5-9 p.m. For $45 per person, a four-course prix-fixe dinner will be served, featuring the dishes that the kids prepped. Proceeds from dinner will also benefit CHOP. To register a camper call the restaurant at (267) 318-971.